NextSource Materials Inc. (TSX:NEXT,OTCQB:NSRCF) is a Canadian mine development company based in Toronto, Ontario, that is now at the pre-construction stage of its wholly-owned, fully permitted Molo graphite project in southern Madagascar to production. Molo is a Feasibility-Stage project and ranks as one of the largest-known and highest quality flake graphite deposits in the world. It hosts a NI 43-101 compliant total combined graphite resource of 141.28 million tonnes grading 6.13 percent total graphitic carbon, with a contained ore reserve of 22.44million tonnes grading 7.02 percent graphitic carbon. A (bankable) Feasibility Study completed February 2015 confirmed that the Molo project is expected to be a lowest-quartile producer due to its low-cost, open pit operation that has a negligible stripping ratio. With already having completed both a front-end engineering and design (FEED) study and a detailed engineering study, the company then released an updated Feasibility Study (FS) in June 2017 on Phase 1 of its two-phased mine approach to production, using a “mining first”, fully modular mine build philosophy. In February 2019, the Company received its mining permit, good for a 40-year term for unlimited production volume with the ability to renew in additional 20-year increments. The updated 2017 FS for the Molo mine outlined for Phase 1 an after-tax NVP (eight percent) of $25.5 million and an after-tax internal rate of return (IRR) of 21.6 percent using conservative market pricing. Although Phase 1 of the Molo mine is modeled for a mine life of 30 years and an annual production rate of 17,000 tonnes per annum (tpa), the actual mine life at 17,000 tpa is over 100 years. Phase 1 will consist of a permanent processing plant with a feed rate of 240,000 tonnes per annum producing 17,000 tonnes of finished SuperFlake™ graphite concentrate at purities between 97 percent graphitic carbon to 98 percent graphitic carbon per annum. This production level will rank the Molo project among one of the top five largest producing mines of graphite globally outside of China. Phase 2 of the Molo mine will be the expansion of SuperFlake™ production to 51,000 tonnes per annum, as envisioned in the company’s 2015 FS. Molo SuperFlake™ has been verified by end-users for use in all the top demand applications – refractory (steel), lithium-ion battery applications, expanded graphite (foil) applications and graphene ink applications. By utilizing a two-phased approach, NextSource Materials has a significant competitive advantage over its peers and ideally positions the Molo project with first-mover advantage while simultaneously creating a competitive barrier to entry. The company is presently focused on securing the US$23 million mine financing (includes working capital) and has already secured a 10-year off take agreement for the entire Phase 1 production volume with a Japanese trading company for EV applications. The two main factors that determine the selling price for graphite is the size of the flake and carbon purity you can achieve in the flotation process. The larger the flake size and higher the purity – the higher the selling price. The Molo deposit is blessed with a very high percentage (46 percent) of premium-priced large and jumbo-sized flake graphite and can achieve near battery-grade purity (98 percent carbon) with simple flotation. The Molo project is consistently ranked by analysts and major graphite buyers as one of the highest-quality graphite projects in the world. 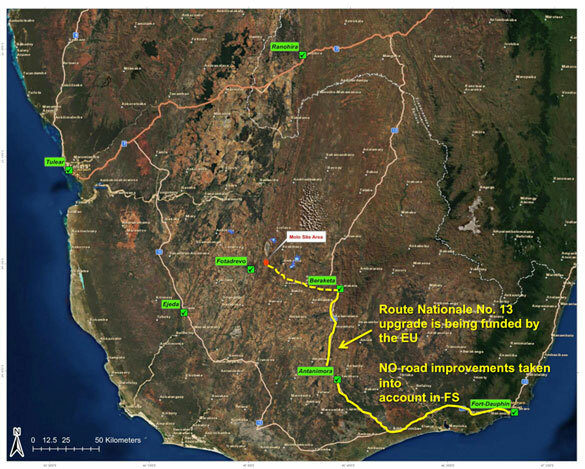 NextSource Materials’ Molo graphite project is located 160 kilometers southeast of Toliara in the Tulear region of southern Madagascar and 220 kilometers northwest of the port town of Fort Dauphin. The company has secured a 40-year Mining Permit from the Madagascar government for the project as well its Global Environmental Permit. “With the receipt of the mining permit, the Company can now implement the final steps in our mine development schedule towards achieving production in early 2020. Madagascar has always been renowned globally for the quality of its graphite, and our Molo project will vault Madagascar to one of the largest producing regions of high-quality flake graphite in the world,” said NextSource Materials President and CEO Craig Scherba. Madagascar is situated in the hub of the world’s leading markets for graphite applications and the country’s world-renowned flake graphite resources are of the highest quality. Molo represents one of the largest discoveries of graphite in the world and its attractive location includes unrestricted access to a major shipping port connecting to key Asian, European and North American markets. The democratically elected Madagascar government recognizes the importance of the mining industry to the nation’s economic growth and is highly supportive of the Molo graphite project. The Word Bank has partnered with the government to implement strategies for improving the country’s business climate as well as social indicators with a focus on infrastructure. In February 2016, the World Bank approved Madagascar’s access to International Development Association (IDA) fnds. The 2016 IDA allocation for the country is $110 million which is set to more than double to $230 million in 2018. Currently, the World Bank has a total commitment of $618 million in investment operations in Madagascar with transport and infrastructure projects accounting for 27 percent. In March 2016, the World Bank announced the country had received an IDA credit of US$65 million in support of improving electricity access throughout the nation. The Molo graphite project is easily accessible by a network of secondary and district roads as well as an all-weather, year-round airstrip adjacent to the property. The deposit is immediately at surface with a nearly negligible strip-ratio (0.81:1) and situated in a sparsely populated, dry savannah grassland region devoid of flora and fauna—ideal for a low-cost, open pit operation. 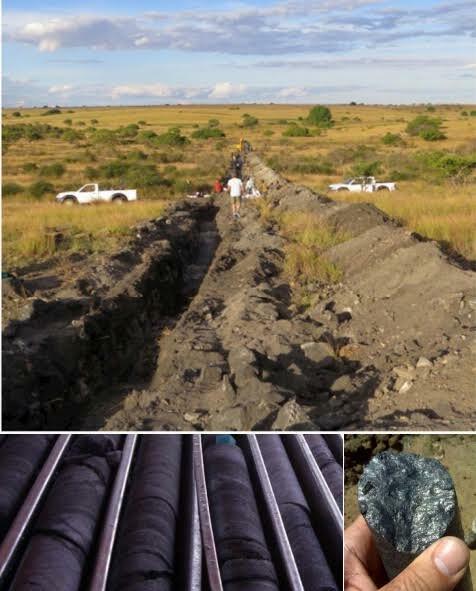 The Molo project represents the first and substantial maiden discovery of high-quality graphite in Madagascar in decades. Comprising almost 50 percent of premium-priced large and jumbo flake SuperFlake™, the Molo project is blessed with an excellent flake size distribution and can produce a SuperFlake™ concentrate between 97 percent to 98 percent carbon purity with simple flotation alone. The Molo deposit can produce a high-quality SuperFlake™ concentrate at one of the lowest operating costs in the industry over a very long mine life. The easily scalable operation has the ability to provide material for any end-user in the refractory, graphite foil and electric vehicle battery markets. The high purity of graphite flake that can be achieved with standard flotation contributes significantly to the project’s low operating costs, as there is no additional need to remove deleterious elements from NextSource Materials’ graphite. “Our Molo SuperFlake™ can approach battery-grade purities with simple processing and this can be an advantage in having lower operating costs when further upgrading to 99.9 percent purity,” said Nykoliation. A number of the world’s leading graphite buyers and processors have validated Molo for all the top demand markets for graphite including refractories, batteries, foils and graphene. Various independent end-user tests have confirmed that the SuperFlake™ concentrate from NextSource Materials’ Molo deposit meets or exceeds the quality requirements for all these end-markets. “As far as we are aware, NextSource Materials has completed some of the most extensive validation testing at the end-user stage compared to its peers and that has provided us a lot of traction with potential strategic partners,” said Nykoliation. The refractory market represents 50 percent of the global demand for flake graphite. Molo SuperFlake™ concentrate has received positive results across all testing parameters from five of the world’s top refractory producers. This industry requires flake sizes of medium, large and jumbo. Nearly 79 percent of Molo SuperFlake™ is classified as medium, large or jumbo flake. The graphite foil market is currently the fastest growing market segment for flake graphite and represents about 10 percent of total global demand. Graphite foils are used in smartphones and tablets, gasket materials in automotive, petroleum, chemical and nuclear industries, and conductive plates in fuel cells and vanadium redox batteries. A leading European manufacturer of carbon-based products has proven that Molo SuperFlake™ can be successfully manufactured into a graphite foil. Independent testing has also verified that Molo SuperFlake™ meets all specifications and quality requirements for specialty graphite foil applications. For graphite foil, jumbo flake is the required manufacturer size. The Molo deposit is made up of 23.6 percent jumbo flake according to the feasibility study. The electric vehicle battery market is the second largest market segment for flake graphite, representing 25 percent of global demand; in fact, graphite is the anode material of choice in all batteries. In lithium-ion batteries, approximately 10 times more graphite is required than lithium itself. Based on demand forecasts for lithium-ion batteries, the demand for graphite in this market is projected to grow by about 10 percent per year. Both a leading Japanese manufacturer of battery anode material and a top European supplier of spherical graphite for electric vehicles successfully manufactured spherical graphite from Molo SuperFlake™ and verified that met all specifications and quality requirements for lithium-ion battery anode material production. Results from verification testing by UK-based Haydale Graphene Industries PLC have validated the Molo deposit as a viable source of graphene nanoplatelets used in the development of graphene inks for printed and flexible electronics. Haydale Graphene Industries is a global leader in the processing and application of graphene nano-materials. According to BCC Research, the global graphene-based product market will grow at a CAGR of 58.7 percent between 2015 and 2020 to reach $675.1 million. In October 2018, NextSource Materials signed a binding offtake agreement with a prominent Japanese trading company. The agreement is for a period of 10 years and will be activated upon the commercial production of graphite at Molo. It also has an automatic renewal for an additional five years. NextSource Materials is currently engaged in discussions with additional strategic buyers regarding additional off-take agreements. Mr. Scherba was appointed President and Chief Operating Officer in September 2012 and has been a director since January 2010. Previously, Mr. Scherba served as Vice President, Exploration of the Company since January 2010. Prior to joining the Company, Mr. Scherba was a managing partner for six years with Taiga Consultants Ltd. (“Taiga”), a mining exploration consulting company. Mr. Scherba has been a professional geologist (P. Geo.) since 2000, and his expertise includes supervising large Canadian and international exploration programs. Mr. Scherba was an integral member of the exploration team that developed Nevsun Resources’ high-grade gold, copper and zinc Bisha project in Eritrea. Mr. Scherba served as the Company’s Country and Exploration Manager in Madagascar during its initial exploration stage, discovering both the Molo Graphite and the Green Giant Vanadium deposits. Mr. Robin Borley is a Graduate mining engineering professional and a certified mine manager with more than 25 years of international mining experience building and operating mining ventures. He has held senior management positions both Internationally and within the South African mining industry. He has most recently served as Mining Director for DRA Mineral Projects and was instrumental as the COO of Red Island Minerals in a developing a Madagascar coal venture. His diverse career has spanned resource project management, evaluation, exploration and mine development. Robin has completed several mine evaluations including operational and financial evaluations of new and existing operations across a diverse range of resource sectors. He has experience in the management of underground and surface mining operations from both the contractor and owner miner environments. From 2006 through to 2012, Robin participated in the BEE management buy-out transaction of the Optimum Colliery mining property from BHP, through its independent listing and its ultimate sale to Glencore in December 2012. Mr. Nykoliation joined the senior management team at NextSource Materials as Vice President, Corporate Development in 2007 and oversees the fundraising and investor relations for the Company. He brings over 16 years of management experience, having held senior marketing and strategic development positions with several Fortune 500 corporations in Canada, notably Nestlé, Home Depot and Whirlpool. Mr. Nykoliation holds a Bachelor of Commerce (Marketing) with Honors degree from Queen’s University and also serves as a director of Red Pine Exploration Inc., (TSXV:RPX) a publically listed gold resource exploration company headquartered in Toronto, Canada. Mr. Johnson is a bilingual senior executive with over 20 years of business experience, including 10 years at public corporations as CFO, VP Corporate Development and other financial management positions, and 10 years in capital markets in investment banking and equity research. Mr. Johnson is a Chartered Financial Analyst (CFA) and a Chartered Professional Accountant (CPA) and joined as CFO in October 2015. He also holds a Bachelor of Commerce (Finance) from the John Molson School of Business at Concordia University in Montreal. Mr. de Bruin has an impressive track record as a seasoned mining industry engineer and executive with substantial knowledge of mining operations on the African continent, Australia and Canada. Mr. de Bruin retired as Managing Director from DRA in November 2016 after successfully navigating DRA through the diversification of its business into Central, East & West Africa. Mr. de Bruin was responsible for leading a globalization agenda that included two significant acquisitions and a horizontal integration into energy, water and agriculture to create sustainability. During his tenure at DRA, Mr. de Bruin was instrumental in growing the mining project portfolio to include design and construction of 35 platinum concentrators, 42 coal processing plants and 12 metallurgical plants across multiple commodities, collectively valued at over $5 billion. Mr. Sanderson has served as Chairman of the Board of Directors of the Company since March 2016 and prior to that, was the Vice Chairman of the Board since October 1, 2009. Mr. Sanderson is a mediator, arbitrator, consultant and lawyer called to the Bar in the Canadian Provinces of Ontario and British Columbia and brings many years of legal and mediation expertise from various industries. He has acted as mediator, facilitator and arbitrator in British Columbia, Alberta, Ontario and the Northwest Territories, in numerous commercial transactions, including insurance claims, corporate contractual disputes, construction matters and disputes, environmental disputes, inter-governmental disputes, employment matters, and in relation to aboriginal claims. He is a member of mediation and arbitration panels with the British Columbia Arbitration and Mediation Institute, the British Columbia International Commercial Arbitration Centre and Mediate BC. Mr. Sanderson also currently serves as the Chairman of the Board of MacDonald Mines Exploration Ltd., a publicly listed resource exploration company headquartered in Toronto, Canada. Mr. Yarie has served as a director of the Company since 2008. Mr. Yarie is an experienced geophysicist and a successful entrepreneur. He has over 20 years of experience in the mining and environmental/engineering sectors. Mr. Yarie has project management and business development experience as he has held senior positions with a number of Canadian-based geophysical service providers. Since January 2010, Mr. Yarie has been Senior Vice President Exploration for MacDonald Mines Exploration Ltd, Red Pine Exploration Inc. and Honey Badger Exploration Inc. From October 2007 to December 2009, Mr. Yarie was a business development officer with Geotech Ltd, a geo-physical airborne survey company. From September 2004 to October 2007, Mr. Yarie was head of sales and business development for Aeroquest Limited. From 1992 to 2001, he was a partner of a specialized environmental and engineering consulting group where he managed a number of large projects including the ESA of the Sydney Tar Ponds, the closure of the Canadian Forces Bases in Germany and the Maritime and Northeast Pipeline project. Mr. Comand is a former executive of Sherritt International, where he held the position of Vice President of Operations for Sherritt’s Madagascar Ambatovy Project, which is one of the largest lateritic nickel mines in the world. Ambatovy is a joint venture between Sherritt International, Japan’s Sumitomo Corp, Korea’s Resources Corp (KORES) and Canada’s SNC Lavalin Inc. Mr. Comand is a Professional Engineer (P.Eng) and Certified Engineering Technologist (CET) who earned his Maintenance Manager Professional Designation (MMP) license in 2006 and his Charter Director designation (C.Dir) in 2012. He is currently consulting for numerous clients around the world in the mining and energy sectors. Mr. Comand spent the past 3.5 years in Madagascar and successfully led the organization through construction, commissioning and operations of the project to commercial production. Throughout his career he has consistently held senior positions in complex operations, business development, environmental management, maintenance, and project construction. Mr. Comand, P. Eng, CET MMP CDir, is a Mechanical Engineer with extensive Madagascar mining operations experience and holds his P. Eng designation in the province of Ontario as well as designation as a Certified Engineering Technologist. Mr. Larson is a Canadian attorney with more than 35 years as a member of the Law Society of British Columbia and has significant experience in the capital markets, specifically the equity and debt sectors. Mr. Larson is a former partner of a major Vancouver Law firm, now McMillan LLP and currently maintains a private practice along with a successful investment business. As an expert in alternate dispute resolution, Dalton has extensive experience as a professional arbitrator and mediator. He holds a Master’s Degree in law from the University of London, England and has served more than 25 years as a director of several investment funds managed by the CW Funds group of companies, affiliated with Ventures West Management Inc., which was one of the largest venture capital firms in Canada. He has served as Chairman of the Board of Directors of a Philippine ethanol company and was a founding shareholder and first Chairman of the Board of Directors of the First Coal Corporation, which started operations in 2004 and raised in excess of $65 million in equity to finance its development activities. This company was sold to Xstrata in 2011 for in excess of $150 million. *Disclaimer: This profile is sponsored by NextSource Materials Inc. (TSX:NEXT,OTCQB:NSRCF). This profile provides information which was sourced by the Investing News Network (INN) and approved by NextSource Materials Inc., in order to help investors learn more about the company. NextSource Materials Inc. is a client of INN. The company’s campaign fees pay for INN to create and update this profile. The information contained here is for information purposes only and is not to be construed as an offer or solicitation for the sale or purchase of securities. Readers should conduct their own research for all information publicly available concerning the company. Prior to making any investment decision, it is recommended that readers consult directly with NextSource Materials Inc. and seek advice from a qualified investment advisor.